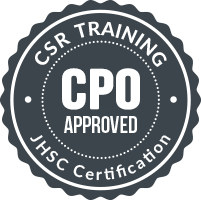 JHSC Part 2 Certification : This course is the second in a series of two training programs which qualifies individuals to act as certified members of a workplace joint health and safety committee. Since this training program has been approved by the Chief Prevention Officer (CPO), successful learners will be granted certified status by the CPO. This certificate is valid for three years from the date of completion of training. Consequently, a successful learner who achieves CPO certification must take Refresher training prior to the 3-year expiry date in order to maintain status as a certified member. You must have already completed Part One training in the past six months in order to attend Part Two. Part Two training focuses on concepts of hazard recognition, assessment, control, and evaluation of controls. Please see below for the list of hazard topics included in this course. We have selected the topics below with office environments in mind. However, this course is relevant to any workplace where the following have been identified as significant hazards. Click the “Register Now” link at the bottom of this page. Fill in and submit the form.